So here it is, the first measurable amount of snow in the Twin Cities this season. Other areas around Minnesota are also getting some accumulation. Those who live outside the major storm track may have to make do with freezing rain this time around. Don’t worry. It’s only mid-November. Your storm is coming. So it goes as our planet spins around the sun, changing it’s angles and plunging us into that uncomfortable place where, for at least 5 minutes and in some cases all day or all season, people cannot remember how to travel safely. If I could have 100 dollars for every fender bender in Minneapolis and St. Paul this weekend, I could open my own auto body shop. But it still wouldn’t be worth it. Let the finger pointing begin! A major benefit of the first significant snow this year is that it arrives on the weekend. For those with Monday-Friday jobs and food in the cupboard, it means they can look out the window with smug satisfaction, thinking – there’s absolutely nothing to be gained by going out there. By taking most of the comfortable outdoor options off the table, nature invites the non-hardy among us to engage with the environment close at hand. Namely, all the inside tasks and pleasures we ignored while taking advantage of an unusually mild October and early November. That game is up. For the cold-shy, the useable world just got smaller. I plan to do some dusting and filing. Yipee! How will the weather effect your weekend? The reason for my fixation with ladders and gravity yesterday – one of the jobs on my list was to wash the outsides of the southward-facing upstairs windows before the weather turns. Yesterday that meant “do it right away”. But much of the day was bright and clear at my house, and direct sun does not help when you’re trying to do a decent job of cleaning glass. So I waited. This is a practiced skill – putting off the beginning of the work until later. Much later. When the sun finally started to disappear behind the hills, I grabbed my bucket and ladder and I discovered that doing this sort of work at night just amplifies the feeling of second-story dread. And I also found it possible, while wrestling with a 12 foot ladder, to write another one of those dreadful sing-song poems about falling. It shone on home and nearby park. I’m washing windows in the dark. The neighbors to their dinners dash. discern. A high pitched, screeching blight. My sqeaking squeegee in the night. A sound the local dogs abhor. What crazy risks have you taken to finish the job? Amid all our talk about missiles and sinking ships, Bathtub Safety Officer Rafferty came by the house yesterday for a seasonal check-up and was alarmed to discover that I had the ladder out. We had a brief, but intense discussion. BSOR: I hope you’re not planning to use this. Me: I AM planning to use it. I’m going to wash the second floor windows. BSOR: Ladders are dangerous. A terrible hazard. Me: I think you’re confused. Gravity is dangerous. Carelessness is a hazard. But ladders can be useful. BSOR: Ladders should be outlawed, or at least fixed with graphic warnings. Me: Graphic like the proposed new cigarette labels? BSOR: Yes, with big, gruesome images of broken bones and severe head wounds – anything to make you think twice. Especially at this time of year when a lot of amateur aerialists go high off the ground to scoop wet, slippery leaves out of gutters. That combination of excessive altitude and loss of friction – it’s horrifying. Like watching a clown walk a tightrope made from banana peels. Me: I don’t have gutters. I’m just doing windows. I’ll be careful. BSOR: Everyone who goes up on a ladder thinks they’re being careful. But they’re forgetting one thing. The universe is perverse, and it has a twisted sense of humor. Remember the Tarzan movies? Me: Of course. With Johnny Weismuller! BSOR: And in those films he had a son. BSOR: I’m sorry to be the one to tell you, the actor who played “Boy” just passed away. He fell off a ladder. Imagine it! You’re famous for being a Jungle Boy, swinging through the trees, and this is how it ends? The universe goes out of its way to mock us! BSOR: And that’s why I don’t want to get out of bed in the morning. Until I realize the bed could catch on fire or a spring inside the mattress could break its moorings and suddenly, violently extend, piercing my heart. So I get up. Me: I appreciate your concern. But I’m going to use the ladder. BSOR: I’ll need to see your LOL. BSOR: Your Ladder Operator’s License. Me: There’s no such thing. Is there? BSOR: In my perfect world, there would be. And you’d have to go through training to get one. They’d teach you about basic stability, extension dynamics, power line awareness, footwear security, tool belt management and the habits of bees. Me: I think the political environment just shifted away from favoring more regulation. I’m going to go up there. BSOR: Sudden shifts of any kind are also very, very dangerous. People don’t recognize the value of balance. Balance in all things! And then he issued me a Safety Police Officer’s Ticket (SPOT) for planning an Above Grade Gravity Rule Altitude Violation And Totally Ignoring Offical No! (AGGRAVATION). I protested, saying I hadn’t done anything wrong. He agreed, and said that’s the best time to “catch” me, before the fact and not when I’m actually tumbling off the ladder. But then BSOR has always loved acronyms and pre-enforcement of rules that don’t exist. What is your policy towards ladders? I walked to the window for a look. A glowing, jagged line pierced the sky. It looked like the edge of an extremely vertical, quite rugged mountain. I suppressed a deep-seated urge to scale it and calmly returned to my desk. “What do the authorities say?” I asked. I returned to the window and watched the telltale line of high altitude vapor as it slowly dissipated into nothingness. I phoned two friends of mine – one dining in a pasture 40 miles north of the scene, and another pal climbing a mountain 40 miles to the south. When I got off the phone I strolled out to the TV station’s remote truck just as the anchor went live with his hysterical report. When he accused me of being a foreign spy, I admit, I bit the microphone. 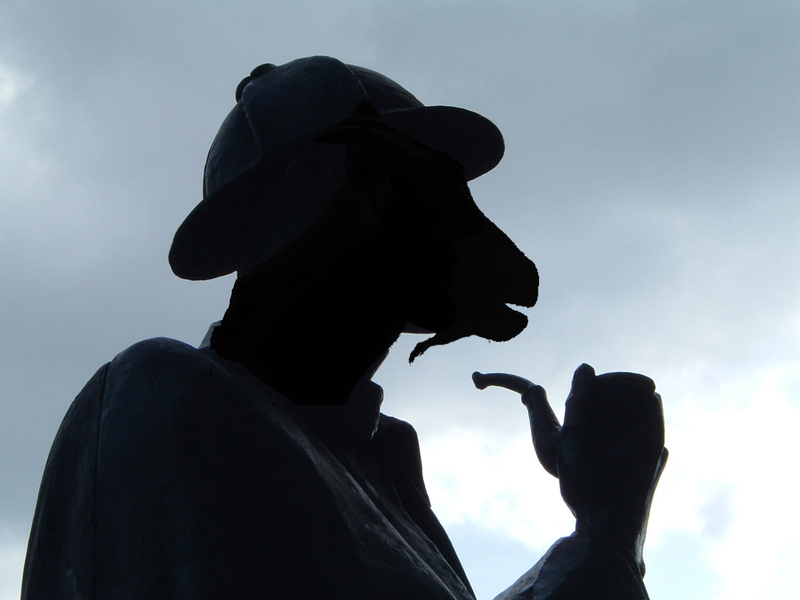 How did Inspector Goatlock know the truth? Yesterday the Cassini mission released this photograph of Saturn’s closest moon, Mimas – an image taken less than a month ago, on October 16th. It has a wonderfully spooky vibe. I can only guess that while flying past Mimas you would get the impression that its singular gaze is following you. Just about every modern moviegoer who sees this crater-pocked sphere thinks it bears an uncanny resemblance to a famous fictitious space object. This is apparently a coincidence. Mimas was merely a dot in space for a very long time after William Herschel first spotted it in 1789. The first close-up photos revealing its Cyclopean flair came from the Voyager missions in 1980. The first (fourth) Star Wars movie was already in (and out of) the theaters by then, debuting in 1977. If travel to Saturn’s moons ever becomes a common thing, one wonders if humans will call this object “The Death Star”. I have to believe it’s possible for a cultural reference to last long after it fades from common knowledge. After all, we’re calling it Mimas right now, and how many people know who Mimas is? But the currents of memory are hard to predict. Future movie loving space travelers might also re-name this moon Wazowski. Perhaps it will be left to the moon’s colonizers to determine if they want to be thought of as Mimanteans, Imperial Storm Troopers or Wazowskers. Of course, given the pockmarked terrain, you can tell they have a local weather problem with intermittent boulder rain. Anyone looking to live on Mimas might just as well be called a dang fool. Place names are important, though. Bali Ha’i, Shangri-la and El Dorado all sound like very nice places to go, but would you really want to live there? If you had to live in a fictional place, where would you settle? Perhaps you caught the Zenyatta story over the weekend, but if not here’s a way to catch up quickly. Zenyatta is a racehorse with a sparkling personality. She dances. She drinks Guinness. And she established a distinct pattern of running over the course of her 20 big races. She tends to fall behind the competition early, sometimes all the way to last place, and then finishes with a breathtaking charge through the pack to win at the last moment. This is a sure crowd pleaser in any sport because people like drama and excitement and surprise. It doesn’t matter if the come-from-behind victor is a hapless baseball team, a Kenyan marathoner or a football squad led by a geriatric quarterback. An unexpected late rally gets the blood flowing, and its dramatic punch is actively promoted by storytellers of all kinds, including those in Hollywood and at ESPN. A video, which has been configured so it can only be viewed by following this link, was produced to promote last Saturday’s Breeder’s Cup. It essentially places the Zenyatta story alongside the great horse racing legends like Secretariat and Seabiscuit, and asserts that she will emerge from the race in her typical fashion as an undefeated, screen-ready phenomenon. So Zenyatta falls by a nose to a horse named Blame. Her first loss. That good old last minute magic wasn’t enough. But don’t blame Blame. Some have said it’s the jockey’s fault, and he was reported to be quite upset at the end of the race. The Hollywood ending didn’t work. Or did it? What is the charm of an ending that is the same every single time? Once you’ve gone through the adrenaline rush of watching this athlete pull victory from certain defeat 19 straight times, how can the exact same scenario be interesting enough for the climactic race? Hmmm. Not too compelling. Finishing second is more complex, and more human. And that’s the attraction, right? Horses R’ Us! But how does Hollywood finish the story? Does Zenyatta sense the crushing disappointment of the jockey, the owners and ESPN? Does she spiral downward into a pit of despair, drinking deeply of her quirky sideline interests, dancing like a floozy into the wee hours at that disreputable stable that never closes? Guzzling tubs of Guinness and gassing on and on to anyone who will listen about how she was once a golden girl, a media darling, and how she threw it all way by waiting a half-second too long, and now she will never be able to put Blame behind her? The elements are in place for a very different kind of horse racing movie, all about habit, hubris and hesitation. The moral? One should not pin one’s happiness and sense of worth on the unlikely success of a last minute rush. 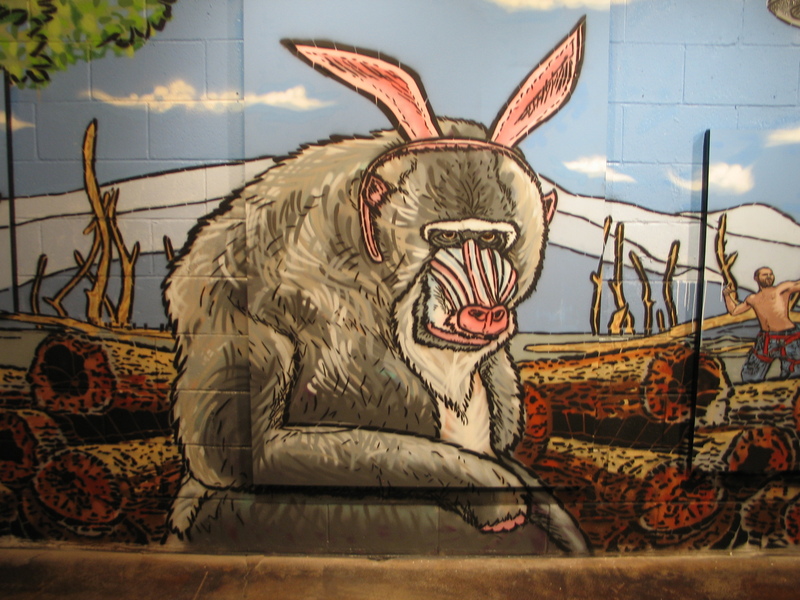 Since this is a baboon themed blog, it is always appropriate to pass along word of a found baboon. I located this one in Minneapolis, at the X,Y and Z art gallery at 3258 Minnehaha Avenue. I THINK it’s a baboon. Or is it a rabbit? A Raboon? A Babbit? This is from an exhibit called “When Trust Is The New Money” by an art collaborative called Broken Crow. John Grider and Mike Fitzsimmons say on their website that they are trying, through large scale stencil murals, to reintroduce wild animals into the urban habitat. Welcome back to the city, baboons! It seems like you never left. The walls at X,Y and Z are covered with this outdoor work brought inside. It also includes, among other things, a man with a chain saw, flying saucers and a bear in a dumpster. The gallery, by the way, serves as the entrance to the Trylon Microcinema, a 50 seat theater with real 35 millimeter projectors and genuine bouncy-backed movie theater seats, showing a wide assortment of films that are brainy, exotic, classic and just plain fun. This month they’re screening Charlie Chaplin films. This weekend’s offering includes “The Circus” from 1928, which was, you may recall, the film at whose Hollywood premiere the newsreel camera caught that time traveler talking on her cellphone! Name or describe a favorite piece of outdoor public art.